Today during the 9:00am service in the Chapel. We are excited to celebrate with four families today as they dedicate their little ones to Jesus. Help a child have a better summer! Stop by Ministry Lane today and find out how you can support The Mustard Seed Summer Lunch Program for kids and learn about their summer day camps here at CrossRoads Church this summer. There are various fun ways to serve and provide nutrition to feed children in July and August. Stop by and say, “Hi” to Scott today in Ministry Lane. Starting his Sunday, we will be providing a trailer to collect your bottles, cans, juice boxes and milk jugs and turning it into money that will impact missions around the world. 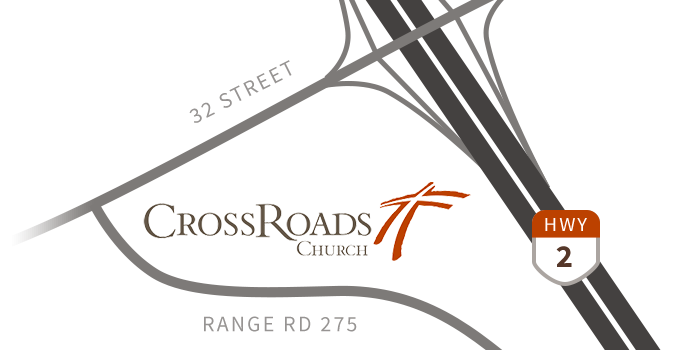 Bring your recyclables to the CrossRoads Kids/Chapel entrance (outside) any time on Sunday and know you are making a difference for the Kingdom! Tuesday, June 12 at 12:00pm. Everyone is welcome to the GEMS June Luncheon featuring the Pastors of CrossRoads sharing on their vital ministries. $10 per person. This will be the last luncheon until September. “Summer Celebration – Ice Cream Social” If you are a single Mom we would love you and your children to join us on Friday, June 15 at 6:00pm in the main foyer at CrossRoads for our wrap up celebration. There will be a bouncy castle, games and activities for the older kids, nursery care for our younger ones and a relaxing evening of connection for the moms. Dinner is provided. Please register ahead on the FaceBook Page or call Mary at 587-876-8302. Look forward to seeing you. Have you ever thought about adoption? 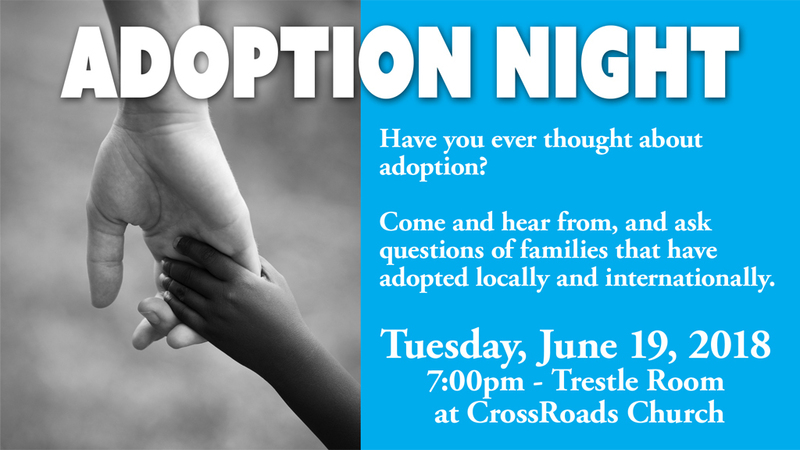 Come hear from families that have adopted both internationally and locally. Tuesday, June 19 at 7:00pm in the Trestle Room. For more information contact Kendra at kendrajadep@yahoo.ca. Wednesday, June 27 at 7:00pm • Join us as we celebrate the great things God has done in our CrossRoads Community this past year! Everyone is welcome to attend. 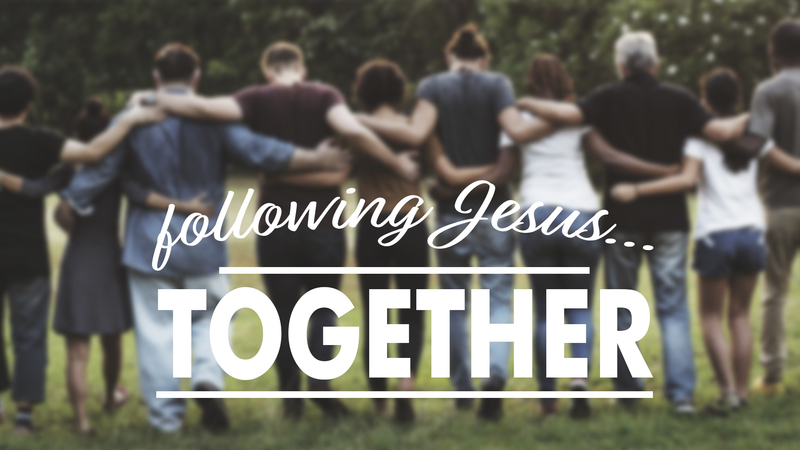 The Meeting Booklet and the CrossRoads Chronicle are available at the Connecting Point or you can download them here! 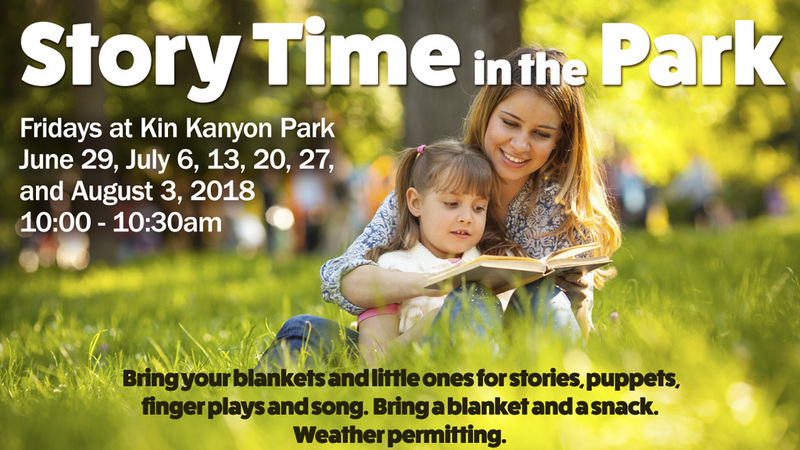 Fridays at Kin Kanyon Park with Pastor Tammy • June 29, July 6, 13, 20, 27, and August 3, 2018 • 10:00 - 10:30am. Bring your blankets, snacks and little ones for stories, puppets, finger plays and song. Weather permitting. 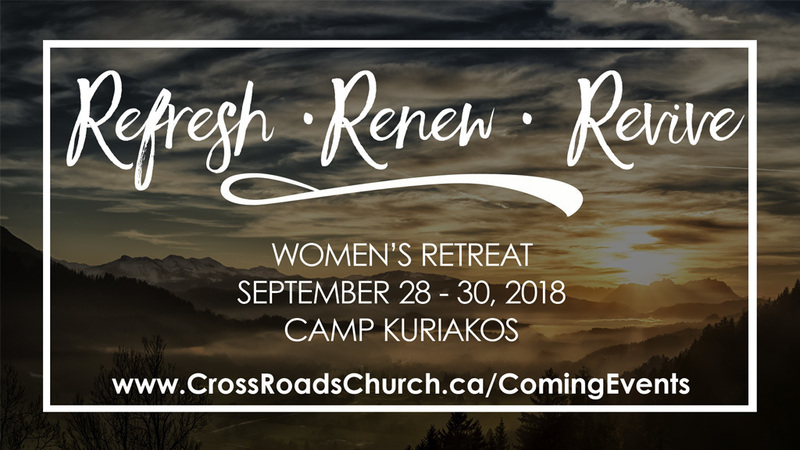 September 28-30 • Join us for a weekend away at Camp Kuriakos to connect with women and be Refreshed, Renewed and Revived in the Lord. Our speaker will be Christelle Baldovinos and the weekend will also include worship, workshops, and more! Cost is $155. Register at www.CrossRoadsChurch.ca/ComingEvents. For any questions, please email womensretreatcrossroads@gmail.com. August 9 - 12, 2018 • Do you want to get away from all the distractions of everyday life? We would love to have you and your family join us at the annual FAMILY CAMP EXTRAVAGANZA!! Come and enjoy God’s creation, meet new friends and be embraced! Family focused camping with rock climbing, hiking, worship. There’s something for all ages! Can’t wait to see you there!! @Kootenay Plains $110per RV unit or tent. For more information contact Katie at brownell@telus.net. Register at www.CrossRoadsChurch.ca/ComingEvents. Missing anything? Your Bible, your coat, your child’s shoe? Maybe you left it here! Our lost and found is located in the Theatre Entrance Foyer. Coats can be found hanging in the main foyer by the Cafe. All left over items will be donated by the end of June. 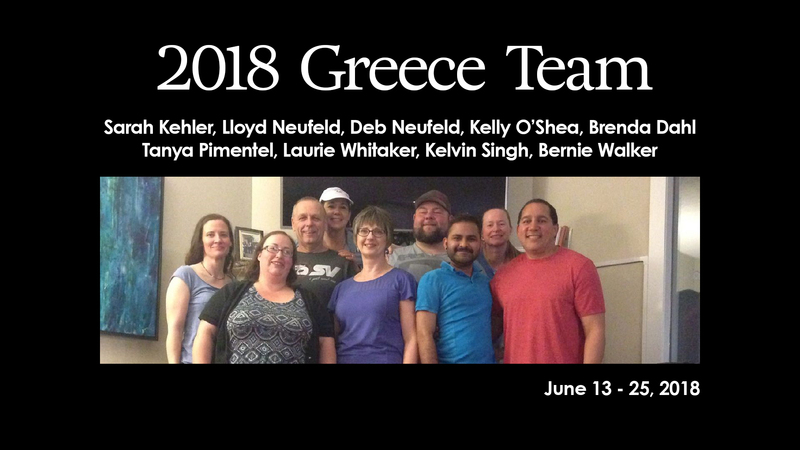 The team is headed to Porto Astro, Greece on June 13 and return home June 25. They will be serving alongside missionaries Andrew and Melissa Fletcher with Hellenic Ministries as they run a Family Refugee Camp. The team will be helping in a variety of ways such as cooking, cleaning, first aid and loving on the families at the camp. Check out this video about the camp in Porto Astro where the team will be serving. Please keep them in prayer this next month as they prepare to travel and then go to serve among refugees at this amazing camp. Join us for the annual Work Bee Day on Saturday, June 16! This year’s projects include; building a new playground, painting, food prep and many other fantastic jobs. Breakfast, lunch and dinner will be provided. Please bring any tools and work wear you have. Contact Jordan with any questions at jordan@riversedgecamp.org. RSVP to the camp at 403-637-2766. Every week, a team of people with the ultimate of servant hearts, faithfully restock and tidy the pews you are sitting in. There is room for YOU to join one of these teams. The only requirement is the willingness to commit two hours every five weeks. Please contact Deborah to be added to the serve list or for more info at Main.Office@CrossRoadsChurch.ca. 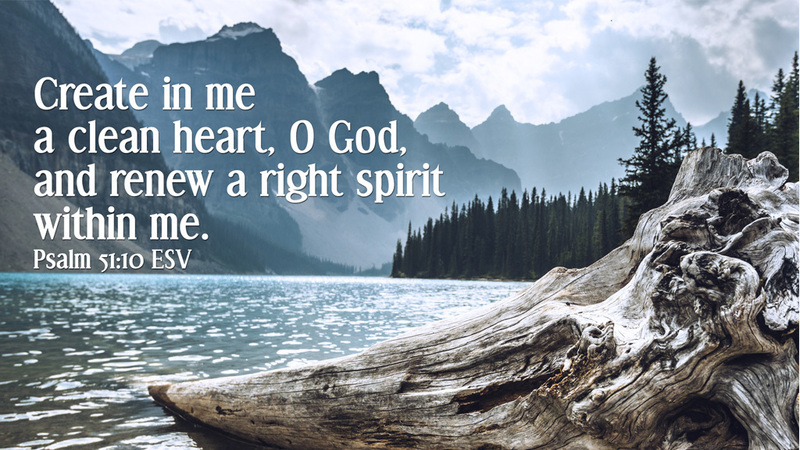 Undoubtedly, you’ve noticed the giant screens in the big house on Sundays – the ones that display song lyrics, videos, announcement screens and Bible verses. We are in need of some willing individuals to join our technical team to help operate these screens! If you can run a smart phone, you will quickly catch on to our user-friendly presentation software. Training is provided on Thursday nights. Please contact WilmaV@CrossRoadsChurch.ca for more information. The next phase planned for our site will consist of an expanded sanctuary, larger foyer, second café, additional office space, and more multipurpose meeting spaces for ministry. The Building Committee is currently conducting a needs assessment with our architect (Axiom) and builder (Timcon) and our user groups, with the hope of having a concept drawing with an estimated budget available for our June Congregation Meeting on June 27. Please be praying for the work being done now to prepare for Phase 4, and that we together would know God’s heart in all these matters concerning the completion of the building. 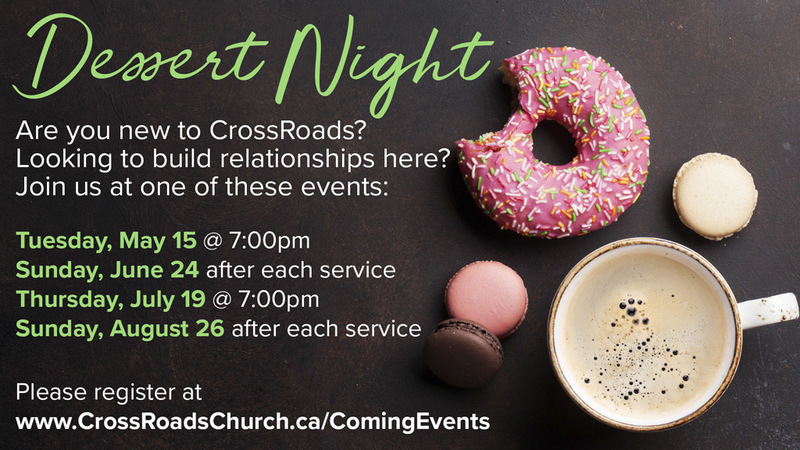 If you have any questions, please email Jordan Polson at JordanP@CrossRoadsChurch.ca. Sunday, June 24, 3 - 8pm at Bower Ponds. A free, outdoor, non-denominational praise and worship event lifting high the name of Jesus! Everyone is welcome. All ages will enjoy this afternoon of praise and worship music lead by guest worship leaders: CrossRoads Kids Worship Team, Embraced, Greg Sykes, Fraser Campbell and Brooke Nicholls. Event goes rain or shine. For more information email: praiseintheparkreddeer@gmail.com.